All of the packaging materials, from the shipping carton to the hangtag are from 100% recycled paper. It was wrapped in a thin paper and tied with natural rope, the outer wrapper is made from recycled paper too. It was very environmentally friendly, LOVE it! Thank you so much to Mindy who has kindly sent me these lovely tank and V-neck top. I was so excited to try them because I've always been curios with bamboo clothing that's all the rage these days. So these are officially the first Eco-Fashion I've ever tried on! It feels really nice to be able to wear clothes that is friendly to the earth as well as to our body. Well, because it's SOFT on you...and EASY on the earth! That's a perfect answer from Bamboosa. Nothing could go wrong with these soft and comfortable clothes from Bamboosa. Not only they are comfortable to wear, they're also Hygienic and protective. Bamboosa's apparel is thermal regulating, odor resistant, anti-static and will keep you cooler and drier in the heat of summer and warmer in cold temperatures. Bamboosa's fabrics also have natural UV protection! How great is that?! 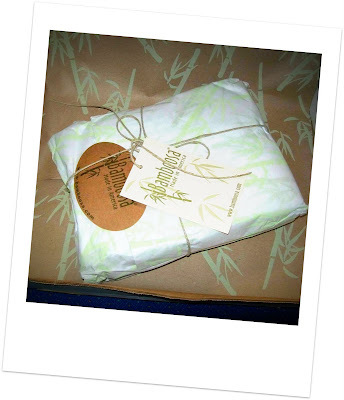 Other thing that I love about Bamboosa is they only use sustainable and certified organically grown bamboo. Bamboo is a renewable resource and it's grown without using pesticides or chemical fertilizers. And at Bamboosa they choose to not use any bleach on their fabrics before dye. All of Bamboosa's clothing and baby products are made in America. The quality of our fabrics and workmanship is superior in every way. Once you've worn Bamboosa, you'll want to wear more. If not, all of our products are guaranteed. We'll pay the postage. You know how I love featuring shops that gives back to the world and Bamboosa is no exception. You should shop at this kind of stores because the happy feeling you get when you shop will get multiplied by a dozen (or more!) because you'll feel good knowing that your money help support the many charities these stores collaborate with. Back to the clothes. I've worn them over and over again because the fabric is oh-so-soft and it feels really comfy on the body. I love the bright colors too (which doesn't fade after repeated washing), they have now became a staple in my everyday wear. You have seen above photo on my previous post, I can easily mix and match this 70/30 Tahiti Blue ribbed tank with my other clothes. 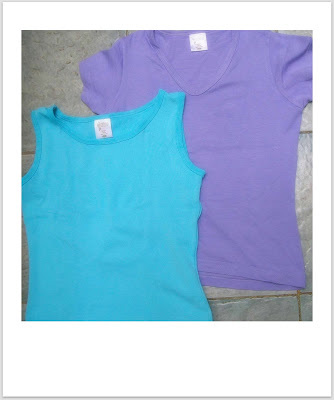 This soft tanktop has a little stretch to it and it was made of blended rib fabric and free of chlorine and formaldehyde. I wore this when I was getting ready for a short weekend trip, it's so comfy to wear on a trip. Oh and they also have Gift Registry ! Now here's a chance for you to give yourself a present this holiday. Mindy from Bamboosa has kindly offer a $50 Gift Certificate to give to one very lucky TTT's readers! Please pay attention to The RULES before you enter. NOTE : Remember to include your email in the comment box so I can reach you if you win. Your entries will be visible after my approval so All entries that does not apply with the rules will not be counted and I will not published the entry! This giveaway will end on Dec 28, 2009 at 24:00 pm. This time the Giveaway is open for US Only! Winner will be announced here on Dec 29, 2009. I will use random.org to pick the winning number. If the winner does not respond within 48hrs then I will have to choose another winner and will announce it again in my blog. This giveaway is also featured on FreeGrechen. I did not receive any form of payment for this review and this is written based on my own honest opinion (other people opinions may vary). Bamboosa gave me the products to be reviewed but that has no impact at all on my opinion. The Bamboosa product I'd love to try is the Sleep Slip. Also I am a visible follower. Can you see me? I want to try the Priya Skirt! I love bamboo, I've had bamboo sheets on my bed for years. I could use the long sleeved top right now! Though I would love to try the soapbars as well. I would like to try the Sukara Long Pant! Thanks for the giveaway! the long jersey scarf looks so comfy and soft!! and it's at a really reasonable price too. i'm loving the one in purely natural. i really want to just grab it, right now, and wrap it around my neck. the sleep slip looks super comfy as well. i def would wear it everywhere, even if i'm not sleeping! I would love to try the Sukara Capri pants, they look so comfortable. Mmm - bamboo - & I love the integrity - OG & US made :) I was gifted a lovely brown bamboo shirt (long sleeve) when I played harp for a local yoga class, (& wear it LOTS) & have a bamboo cami , T, & socks. I'd love a sleep shirt - & more socks - the pants look comfy, too! Oh! & I have a wonderful bamboo charcoal soap that I LOVE!! I love the Cap Sleeve V-Neck in Ocean Teal! I like the Bamboosa Sleep Slip. I follow you publicly on Blogger! I'd love to try the Cap Sleeve V-Neck! I'd love the Priya Gaucho and Long Jersey Scarf. I like the Priya skirt. I would really like to try the Sukara Long Pant! I follow on Goggle Friend Connect. 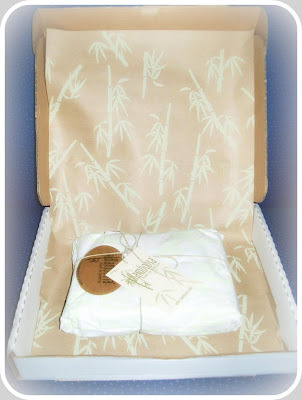 The Bamboosa sleep slip looks inviting and comfy. I love the Sukara Long Pants! I also entered the Piggy Paint giveaway at TigerLily's Book. I'd love a Priya Skirt I think! I like the Sukara long pants. I love the bamboo baby gift set number two with the hooded towel and washcloths in natural color. I'd ove to try the Bamboosa socks for adults. I'd love to try the crib sheets for my son. I entered the Snack Taxi giveaway. I would like to have the Sukara Long Pant. Thanks for the giveaway. At Tigerlily's Book, I entered the Pulsa Yoga giveaway. At Tigerlily's book, I entered the snackTAXI giveaway. At Tigerlily's Book, I entered the Piggie Paint giveaway. At Tigerlily's Book, I entered the Bagnesia giveaway. Tough decision! I believe I would most like to try the Women's Long Sleeve V-Neck and the Adult Crew Socks. #1...I am following your blog on Google Friend Connect (username Nelsby). #2...I am following your blog on Google Friend Connect (username Nelsby). I subscribe to your blog's RSS feed. I am following your blog on BlogLovin (email address below). #1...I subscribe to your blog feed via email. #2...I subscribe to your blog feed via email. i also like the sleep slip. I would love to try the RE-Tote in all four colors to take shopping! I really like the Adult Beanie in the olive green color shown, even though its not an option to buy now, maybe they are just out of stock. Gift set for her sounds nice. i love the Priya Boat Neck Long Sleeve! I'd like to try the Bamboosa sleepshirt. I would like to try Pria Boat Neck Long Sleeve. I love the long sleeved v-neck top! I entered the Bagnesia giveaway. I love the Priya skirt! I'd love to try the Sukara Long Pants, it looks so comfy...I'd wear them all day! i would love a sleep shirt!